I didn't even get as far as the race hall - or the lower two halls, come to think of it. Managed to get a few stainless steel bolts, a couple of mirrors and my fork bottom nuts. Very poor show - it looks like folks are supporting Alan Wright, who is holding his off road show at Telford next weekend. Looks like I will be there getting the bits I didn't get this weekend then. Came back and took the MZ up to Ian's garage. Did some front mudguard fixing on the B33 then ran it to check the charging system. Oh dear, what's that noise coming from the engine ? 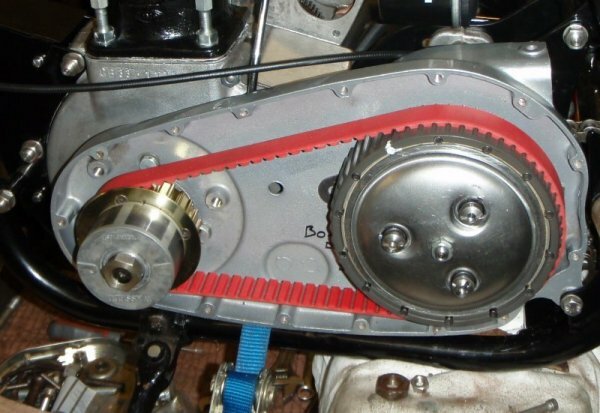 Looks like the drive belt front pulley may be loose on the splines. Time to make a new, larger diameter, pulley spacer . . . but that's a job for tomorrow.